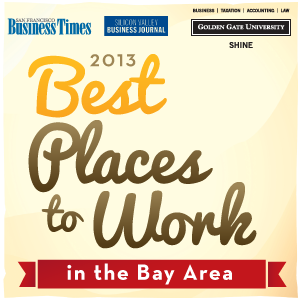 MuleSoft has been named one of the “Best Places to Work” by the SF Business Times. The Times’ rankings are based on anonymous, voluntary surveys which rank their employer in areas such as teamwork, retention, co-workers, manager effectiveness, trust in senior leadership, benefits and overall job satisfaction. So what is it about MuleSoft that makes it such a great place to innovate and work? I joined MuleSoft about 6 months ago as VP of Engineering, so I have been able to look at things from a newcomer’s perspective. We have a huge challenge ahead of us – to disrupt a $500 billion industry – and it’s going to take some of the smartest and highly motivated people in the world to do it. It starts with every person who comes in the door. We constantly look for people that are curious, creative, deep problem solvers and results oriented. It’s great to be in a company where everyone around you raises the bar. Transparency is key for any company that wants their employees make great decisions and feel like they are key to the success. Revenue, metrics and goals are shared with the whole company, all the time. Weekly all-hands meetings allow employees to ask any questions on their minds and get direct and honest answers. We maintain an open workspace without any offices – our CEO sits at a desk next to our engineers and marketing team, making it a very open and casual environment. The final aspect of openness is on a personal level – employees at MuleSoft are direct with each other and speak honestly and openly, there is no politics – all of this leads to an environment of trust. All our employees feel empowered to make decision and take initiative. Growing at the pace we do we come across new and unique challenges every day. Everyone feels empowered to personally remove obstacles and get things done. We look for creative people, who enjoy a challenge and coming up with unique solutions to really hard problems. From engineering to marketing to sales I see people constantly coming up with new ideas and novel ways of solving problems I haven’t seen before. Creativity and innovation seems to happen on every level across the company. We were founded as an open source company and we value technology innovation, team collaboration and building great software products. Our developers get to work on some of the most challenging and complex problems including creating products that power integration at some of the biggest companies in the world and building next generation cloud platforms. We hold meetups and hackathons many times a year where our engineers brainstorm new ideas, use bleeding edge technologies and work together to improve our products and take them in new and unique directions. In our hackathon last month we had over 18 projects and ideas that our team worked on over a 24 hour period, many of which will end up in our product suite or being adopted by engineering. The ideas ranged from a raspberry-pi enabled robotic car running Mule to a version of our Cloud ESB supporting HA using Redis on AWS to a speech-to-text translation engine to route calls to the correct support team. Our engineers also get a lot of opportunity to travel and meet customers at company events and receive feedback first hand from the customers using our products. We believe it’s possible to be ambitious, hard working and game change an industry while also having a fun time doing it. Whether it’s all-company white water rafting trips, weekly happy hours, cooking each other waffles for breakfast or creating fun videos that make us laugh every time we see them over a beer. There are over 150,000 developers using our platform and over 3,500 companies worldwide. Not many companies of our size have those statistics and scale behind them. Yet we feel like we’re only getting started. It’s great to be doing this in a company that has now been voted one of the best places to work, again. If you think this may be the best place to wok for you, we are hiring.